Gary grew up with several learning difficulties – namely stuttering, dyslexia and auditory discrimination. He found that he was able to overcome these challenges and leverage his personal experience to help students with learning disabilities succeed. Having taught science for 20 years, he managed to realise a personal dream by creating the Blissfield Environmental Life Lab (BELL). This is a 45’ by 60’ climatically-controlled greenhouse with a variety of biomes (tropical rainforest, desert, bird aviary, invertebrate zoo, etc.) where students of the entire school district can experience science and practice investigating, exploring and collaborating. Experiencing science in a cross-curricular, hands-on manner at this state-of-the-art facility has been shown to have a positive effect on achievement of students at Blissfield Community Schools. 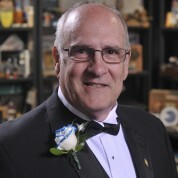 It has also garnered Gary a raft of awards, including the 2013 National Shell Teaching Award and induction into the 2014 National Teachers Hall of Fame. Gary has developed a new elementary science curriculum and has been invited to help shape educational reform in Michigan.